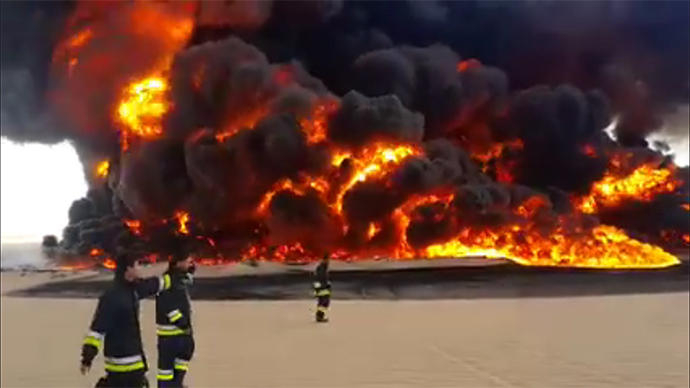 Libya’s Waha Oil Company has posted a video on its Facebook page showing the fire that raged through El Sarir oil field and halted oil flows to the Hariga port, in what is believed to be an act of sabotage. No group has so far claimed responsibility for Saturday’s fire. публикация ‎شركة الواحة حقل الظهرة Waha Oil Company Dahra Field‎. Oil terminal supervisor Rajab Abdulrasoul told Reuters that the El Sarir pipeline was hit at around 5 a.m. local time, and resulted in a fire that shut off flow to the port. The El Sarir blast and subsequent fire comes in the wake of Friday’s attacks on the nearby Makruk and Bahi oil fields. Gunmen assaulted the Bahi oil field on Friday, while the neighboring Mabruk oil field was also stormed that day. Earlier this month, nine guards were killed and three workers were taken hostage in an attack on Mabruk. The country’s energy sector is a frequent target for attacks, as fighting between rival factions continues. Post by ‎شركة الواحة حقل الظهرة Waha Oil Company Dahra Field‎.